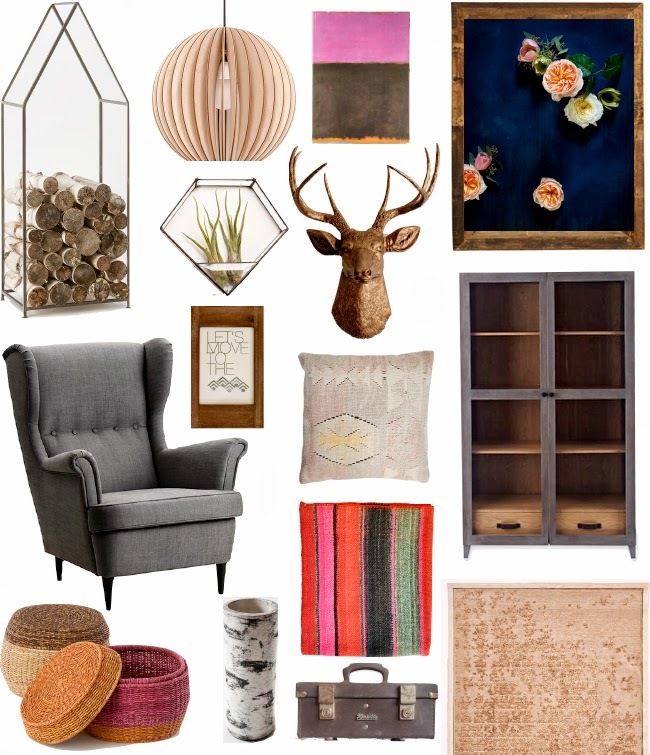 A Winner + A New Giveaway! Giveaway: Win $100 to National Builder Supply! Costume one complete! 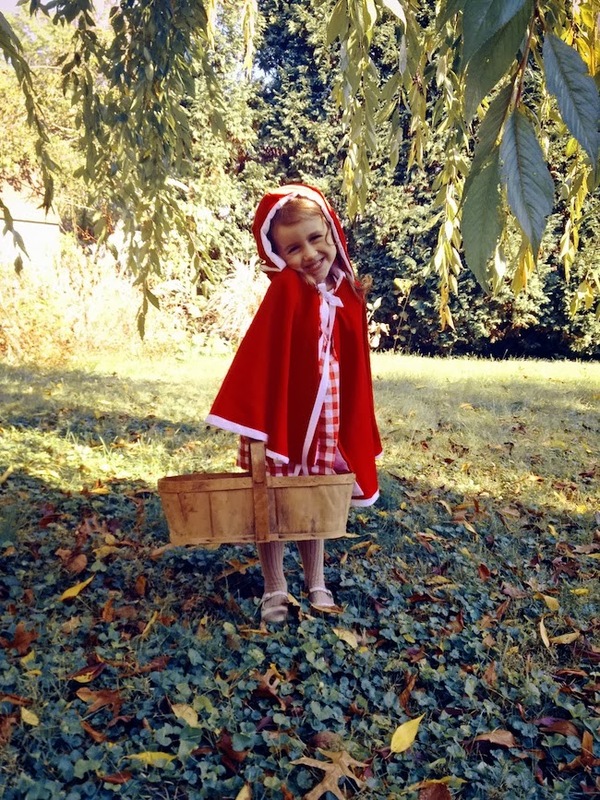 Can't wait to get this pretty Little Red Riding Hood together with her big bad wolf :) (Although the adorableness of that scenario may just be the death of me!) A big thank you to my mother-in-law for turning some random Salvation Army fabric into something beautiful for my little girl - amazing how a cape and a basket can transform a regular old outfit into a cute costume. Lucy goes in the Ergo carrier. 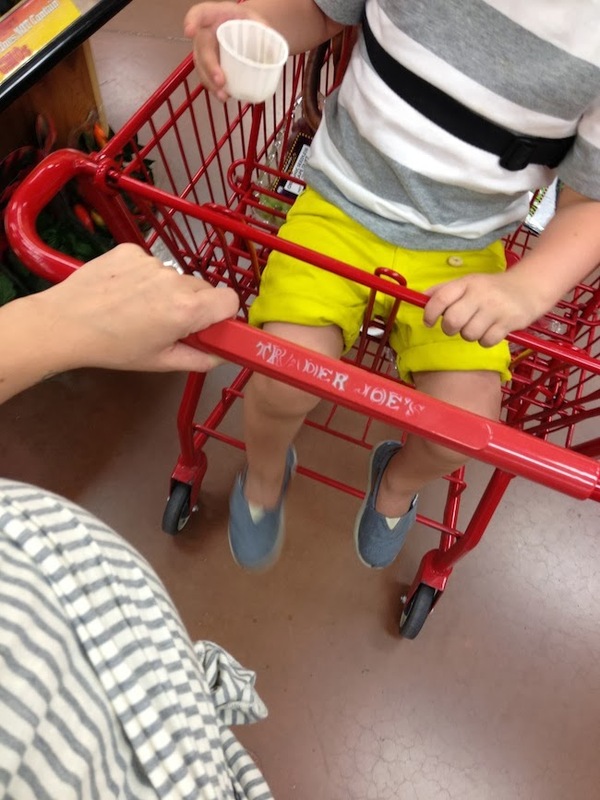 Our grocery store does provide carts onto which you can safely strap your car seat, but then Violet is forced to walk and I have to lug the car seat up to the store and hunt for those particular carts which are not always in the same spot, gah! So we've given up on that and just keep it simple with the Ergo. Violet either walks or goes in the cart. She always wants the car cart (does your grocery store have those? That thing that seems like a cute idea before you become a parent, but then you realize that the thing is seriously like driving a tractor trailer?) Now that I have two kids I've learned that I just have to say no for my own sanity. I also take advantage of the deli kiosk - it saves so. much. time. I go there first, punch in my deli order, and come back after I've done the rest of my shopping to pick up my lunchmeat and cheese. It seriously shaves at least ten minutes off of my shopping trip! 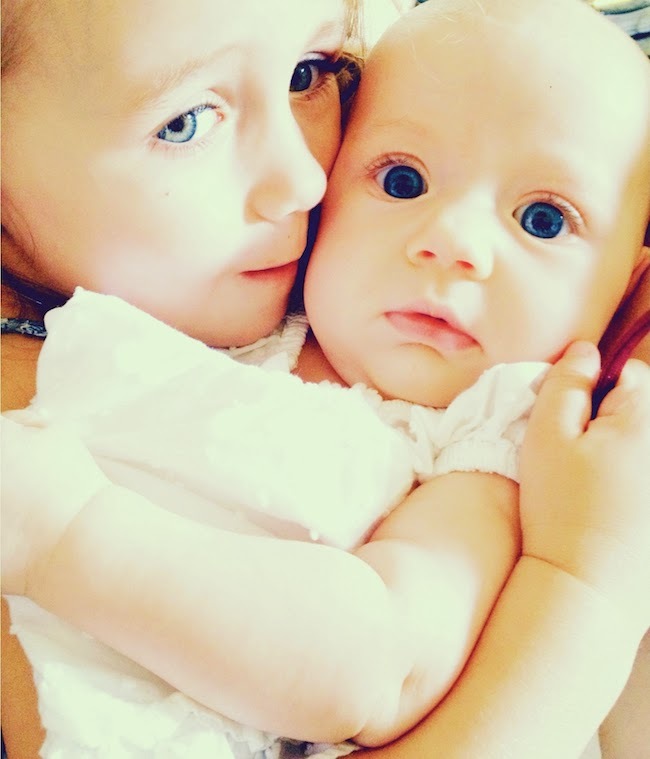 Since they've both gotten older and I've gotten more experienced with juggling two kids the grocery store has gotten a lot easier, but when Lucy was a newborn and Violet had just turned three, there were some seriously trying times. 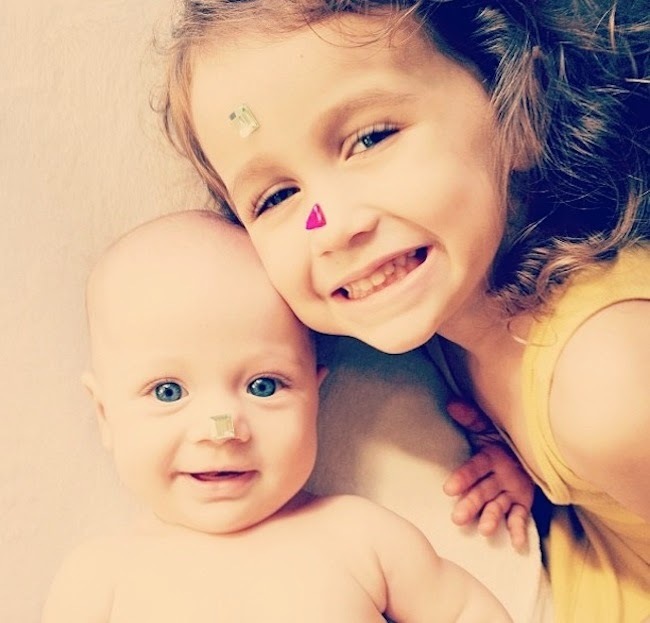 On one particular occasion I was completely exhausted when I left the store - Violet had had a couple of tantrums (she was newly three and had a tough time adjusting to sharing me right after I had Lucy), I was still sore from giving birth, had sprinted to the restroom twice carrying both of them (toddler pee emergency! ), Violet had spilled her snack all over the floor in one of the aisles, and I was incredibly sleep deprived. I just wanted to cry as I was finally putting my grouchy preschooler, fussing infant, and giant cart full of groceries into the car, when a sweet older woman came up and gave me a smile and a knowing look. She said, "I know how tired you must be sweetie - let me take that cart back to the store for you." It was such a small gesture, but it made such a difference. Amazing how one small, kind gesture from a stranger can completely change your day for the better! How I do the grocery store has drastically changed in the past two months with the birth of my second son. Now, it's all about planning ahead (put the baby in the wrap, get my oldest out of the car, put him in the cart, plan ahead in case of a toddler meltdown or other bump in the road...). At first it was challenging but now juggling two kids and six grocery bags has become my new (crazy) normal. 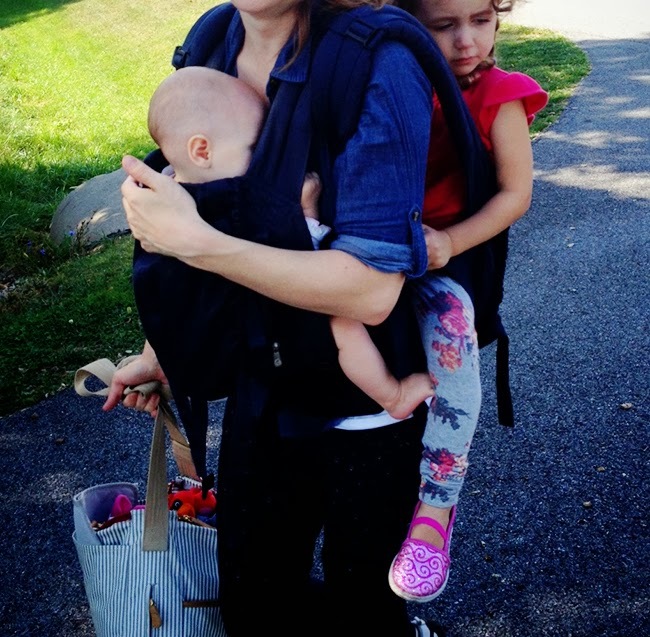 I am in awe of the mamas who do it with three or more little ones! The grocery is easy for us. 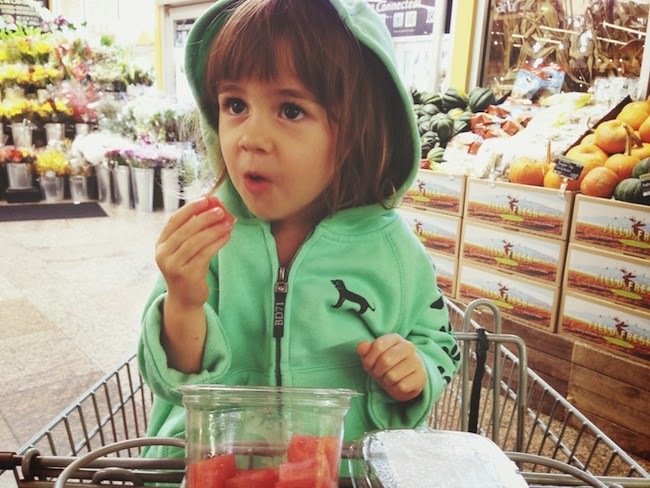 Every other week we pick up a share of vegetables at a stranger's house (not as creepy as it sounds), and the other weeks we grab a sweater for the air conditioned and chilly Whole Foods and plop down in a cart. Sometimes we snack, usually we don't. And Marlowe ALWAYS helps to unload the cart - it's a must. P.S. My Everyday Stories We're Reading and my Mom Uniform. 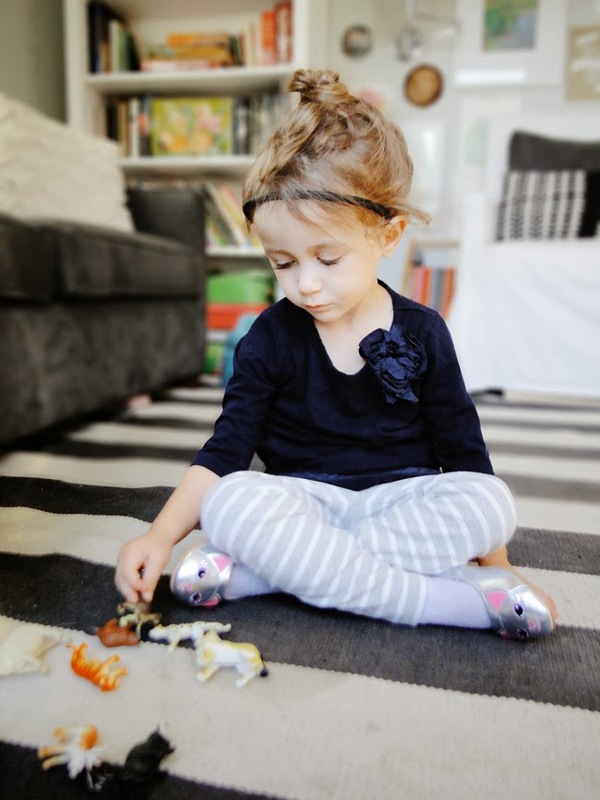 Lucy's super adorable sweater is c/o Totoknits and her headband is from Juniper Wilde. P.P.S. 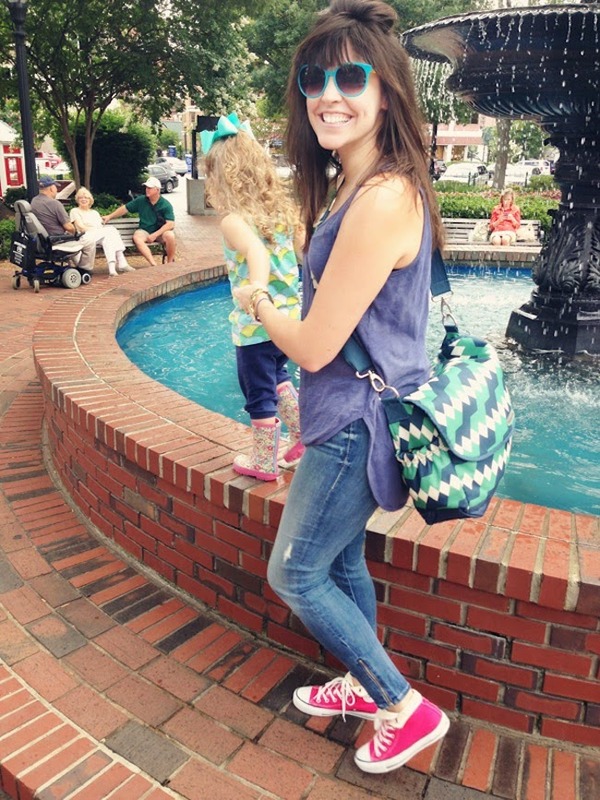 The winner of the Pampers/P&G Giveaway is Jess J. Thanks to all who entered! P.S. 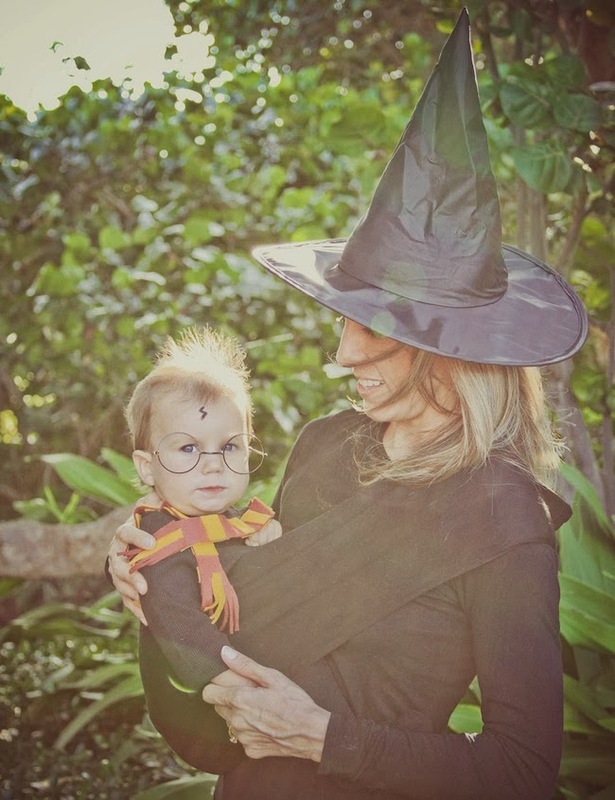 Isn't this Harry Potter baby just adorable? You can actually purchase this costume over on MammasMilk on Etsy. 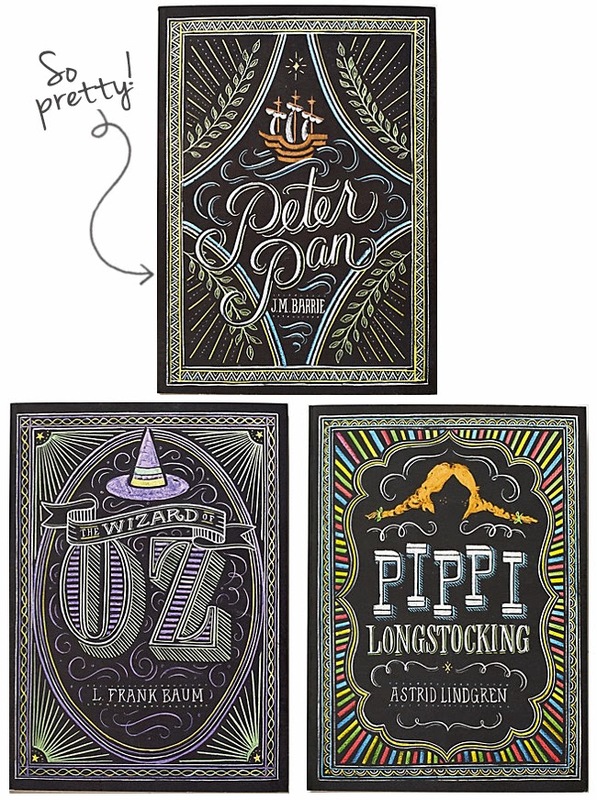 I'm completely smitten with these pretty children's books over at Anthropologie - curse you Penguin for making me want to re-buy books that I already own! 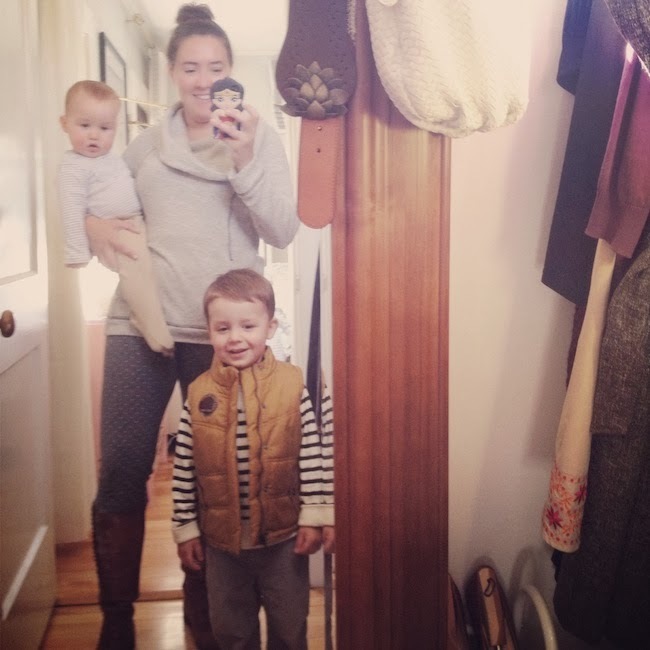 I think it's an understatement to say that my everyday wear has changed since becoming a mama. Now instead of just considering, "Do I feel good in this?" I have to think about if it's appropriate for nursing and practical for all of the bending over, crouching down, jumping, tree climbing, sliding, and sitting on the floor that comes with being a parent. Also, comfort ranks much MUCH higher on my list these days. As a result I generally wear a nursing tank under my shirt in place of a bra, that way when I lift up/unbutton my shirt to feed my tummy isn't hanging out. I choose looser more forgiving tops to hide that last five to ten pounds in my mid-section. I also like longer shirts so that when I bend down I'm not showing skin. As far as pants are concerned I think jeggings are the way to go! While I HATE that word - sounds so gross lol, I love the look and feel. And FLATS. Makes me feel somewhat put together while allowing me to carry my girls all over creation if necessary. My heels get busted out for playing dress up and the occasional date night and otherwise they basically collect dust in my closet, as does my jewelry. It's just not worth getting a necklace yanked off, earrings ripped out, or accidentally stabbing/scratching/scraping my babe with a ring. Last but not least is the essential ponytail/top bun/braid. Otherwise I believe I would have maybe three hairs left to my name. This outfit is one of my go-to's. The top is Old Navy (similar), jeggings are actually Gap maternity lol (on super sale), and flats are Old Navy as well. Which reminds me that I forgot to mention cheap ranks high on my list as well! Jeans and t-shirts all the way, comfort and style are inseparable in my books - also as a Mom it's really great to be able to add super cute scarf like this one to an everyday outfit. Riding boots or ballet flats, depending on the weather. My favorite pair are from Anthropologie a few seasons back. My uniform is typically skinny jeans or pants with a longer, flowy top. It's easy, quick, and I love not worrying about my top riding up or getting awkwardly positioned. My red Converse are a favorite for the park or walks; they are comfortable, but still feel somewhat put together, and now that it's getting (very slightly!) cooler, I sometimes switch them up with booties and throw on a cardigan for warmth. Thanks ladies! Check out all of their blogs - they are amazing ladies. 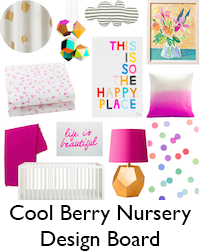 Brandy has the most adorable and stylish kids, Joni whips up amazing idea boards for kids' rooms, and Dina is a DIY maven. They're all on my regular blog roll, and if you don't already read their blogs I bet you'll love them as much as I do! So what about you? Link up your go-to mom uniform below or leave a comment telling us what's changed about your style since you became a mama. So I know I owe you all a winner for the National Builder Supply giveaway! Sorry for my tardiness, but Violet has been sick again (this time a stomach bug/fever - ugh), so I'm a bit behind on these things - I hope you'll understand! So without further ado - the winner is ThisSideOfGaudy! Please email me to claim your prize! And for everyone else, don't fret, I've go another great giveaway lined up for you today! I'm really excited to be partnering with Pampers and Procter & Gamble to offer you a $50 gift card that can be used at Acme, Albertsons, Jewel-Osco, Shaws, Lucky, Cub Foods, Farm Fresh, Shop’n Save, Hornbacher’s or Shoppers, as well as a pack of Pampers Wipes Baby Fresh! 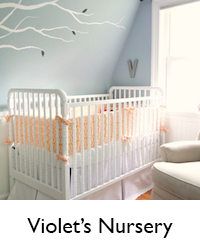 Pampers is the only brand we use on our babes (we use the Sensitive type), because it was the only diaper that our sweet Violet could use without getting a horrible rash. Her skin was super sensitive due to her FPIES, and I was so appreciate that there was a disposable diaper on the market that she could wear. 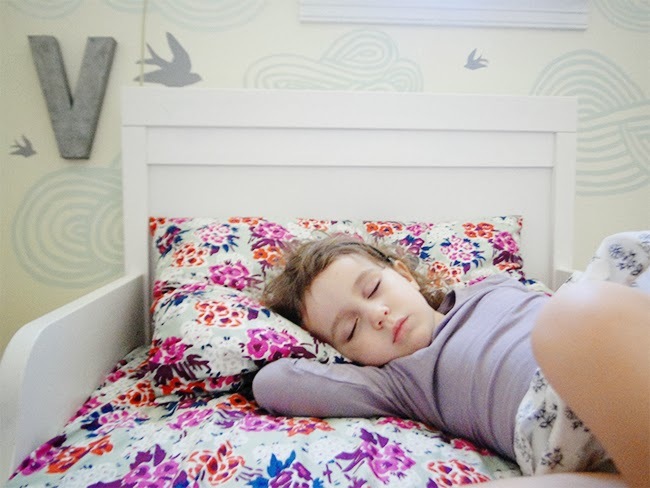 While I would have surely considered cloth diapering had I been able to stay home with her longer, that wasn't an option, so I'm not sure what we would've done without our Pampers Sensitives! Not only are they already our favorite brand, but Pampers has been making improvements to their Pampers Swaddlers - they're now available in size 3 & 4 at Acme. Swaddlers 3 and 4 will include both the wetness indicator and absorb-away mesh liner that we love in the smaller Swaddlers sizes (yay!). Plus Pampers wants to provide mom visual cues of comfort and protection, so they are adding an umbilical notch on Size 1 & 2. Babies’ health and safety is the number one priority at Pampers. 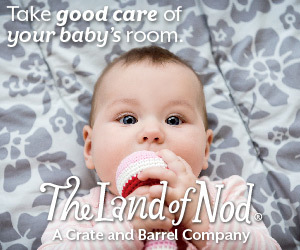 They have a very rigorous safety assessment process that all of their products go through before ANY baby uses the product, as well as ongoing checks during their production to ensure each Pampers product meets the highest safety standards. Thanks Pampers for the prizes and for keeping my babies' bums healthy!!! P.S. The prize pack was provided by Procter & Gamble - all opinions stated are my own. Giveaway is open to U.S. residents. Entries will be accepted through Friday, October 18, 2013. Since becoming a mama of two I can probably count on one hand the number of moments I've had to myself. I mean, I haven't had a haircut since before Lucy was born, or a girls' night out, or really a full night's sleep for that matter. And I'm not complaining - it comes with the territory of being a parent, am I right? I am completely and utterly in love with my girls and am absolutely thrilled that I'm able to stay home with them for over a year - I feel SO incredibly lucky. But let's be honest, everyone needs a little time to themselves now and again! Another inexpensive and easy way to create a costume for your little one is to modify a basic hoodie. My love for this method is not new - I first discovered it via this Etsy shop a few years ago. It's cheap, easy, and the best part is it's WARM for those of you who live in a place where October 31st = cold. fox (this one's made using a hoodie + a thrifted coat - a great idea if you want to keep your little one extra warm. I could go on and on - the possibilities are seriously endless! 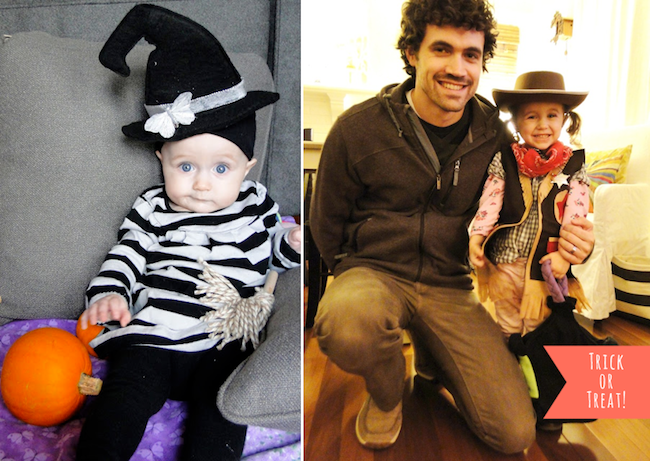 On the left is my daughter on her first Halloween. We took her to the neighborhood Trunk-or-Treat and at the last minute I decided she should have a costume. I made a witch hat out of felt and pinned it to one of her fabric headbands, put on her striped dress and some black tights, and made a broom out of a dowel rod and some yarn. On the right is last year's trick-or-treat. Basically her own clothing with a vest I made using this tutorial (again out of felt and hot glue lol), her Poppy's bandana and a hat that her dad picked up at the local party store. 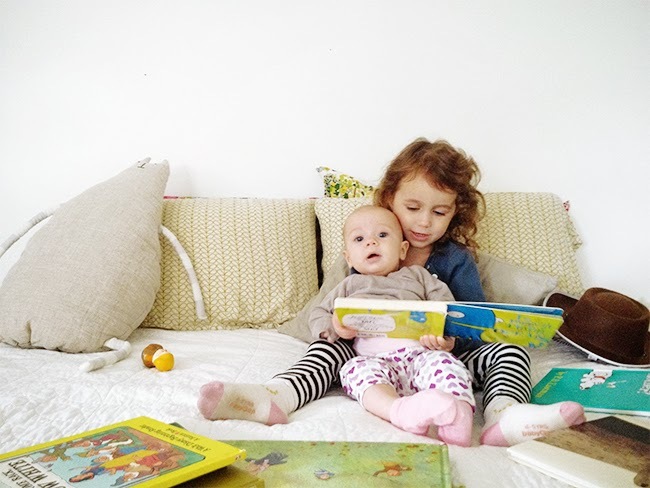 Lately when we read, Violet actually likes to read to Lucy. No, she can't read words yet, but she knows a lot of her stories by heart and makes up the rest from the pictures. It's so much fun to watch as a mom! A lot of our books these days actually come from the Salvation Army. Most are 25-50 cents a book, which you really can't beat, and a lot are in great condition. It's definitely a hunt to dig through all of the shelves and bins and boxes compared to typing in the title of a book on Amazon, but it's worth the savings for sure! 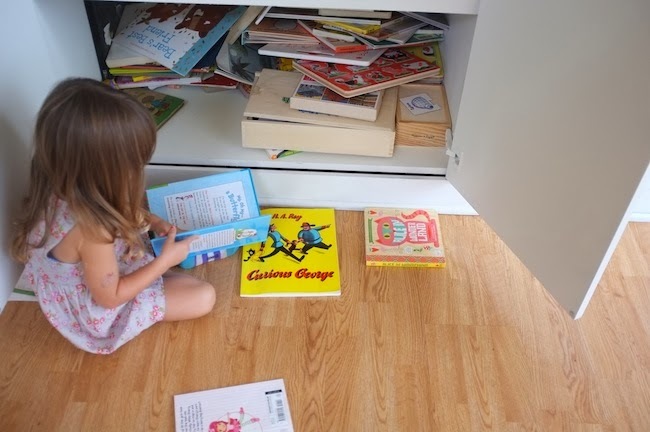 Sometimes I have to dig a book back out of Violet's basket that I know she won't like and sneak it back onto the shelf :) I think she enjoys the hunt just as much as I do! 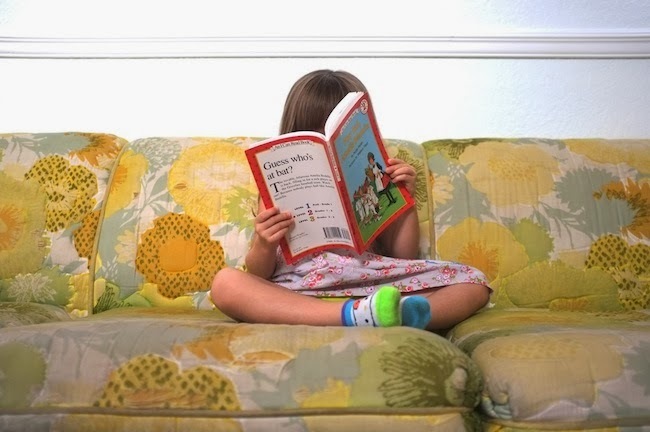 Her current favorite books include anything Disney princess, Are You My Mother? and Little Owl Lost (which are very similar storylines), I Want My Hat Back (although she doesn't quite get the story yet she still loves it anyway), a book of fairy and folk tales, and most Dr. Seuss tales. This is the first year that both of my kids are going to school full time. Harper is 4.5 and Rexford is 3.5 years. They attend a Spanish immersion elementary school that starts at 3 years old. It is a fabulous curriculum that teaches about a third of the six hour day in Spanish. Once they reach kindergarten it will be 50/50 English/Spanish. When we walk into the classroom each morning we are greeted with, "Buenos dias!" and all kinds of friendly Spanish chatter. It is fascinating to see all of these little ones following Spanish direction already. No joke when they say children are like little sponges! When I pick the kids up from school Harper is usually singing some fun Spanish song (lately Un Elefante se Balanceaba) the entire ride home. She has also started correcting my pronunciation on things like "verde" and "delicioso!" A few weeks ago, the school sent home the first of the monthly Scholastic Reading Club flyers. The flyers look exactly the same as they did 25 years ago... that same newspaper print! Since they are at an immersion school, Harper and Rex brought home both English and Spanish book flyers. 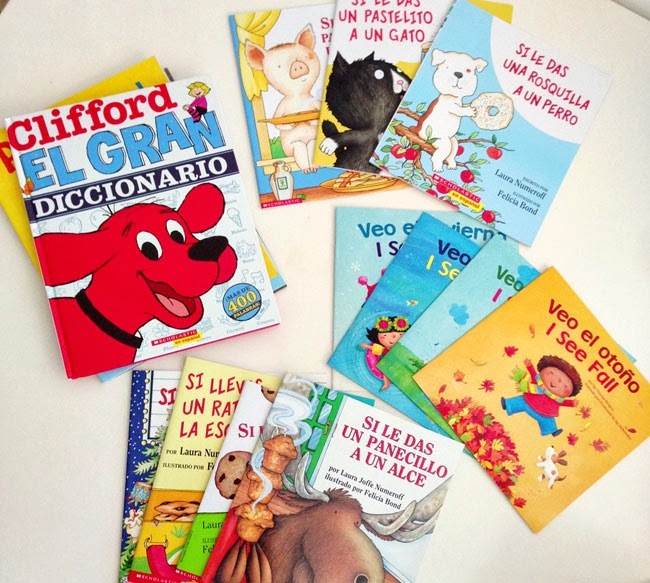 We ordered a ton of new books, mostly in Spanish since our current book collection is almost entirely in English. I love the idea of ordering from Scholastic because each book you purchase earns points for the classroom library. Supporting the public school system and its fabulous teachers is really important to me! Almost every evening after school we pick out a few of our new books, get into bed, and spend about 15 minutes reading together. The kids are usually exhausted so laying in bed with a bunch of books feels like the right thing to do! (If you're interested all of the books below can be found and ordered through Scholastic.com). Thanks so much Lauren for letting me share a bit about the stories we are reading! Here is the schedule of topics in the My Everyday series if you want to play along! P.S. Don't forget to enter to win $100 to National Builder Supply! P.P.S. 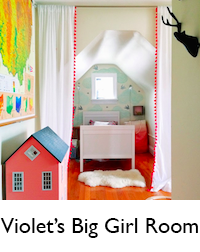 My dream laundry room and a circus-inspired nursery. 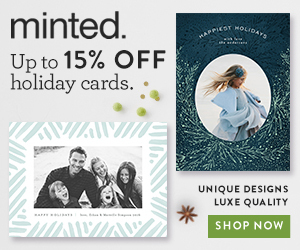 Only open to U.S. residents. Giveaway ends on Friday, October 11th at 11:59 PM. 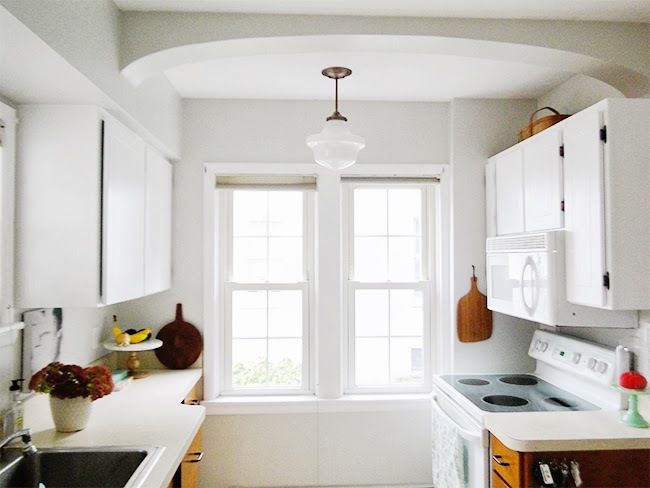 You may remember the hideousness of our plastic light fixture from the before photos of our kitchen. It was meant to look like a capiz shell pendant, but it was definitely plastic and definitely not our style. The other light in our kitchen was a very dated ceiling fan. They always drove me crazy, not only because of how they looked, but also because they weren't centered with the windows. 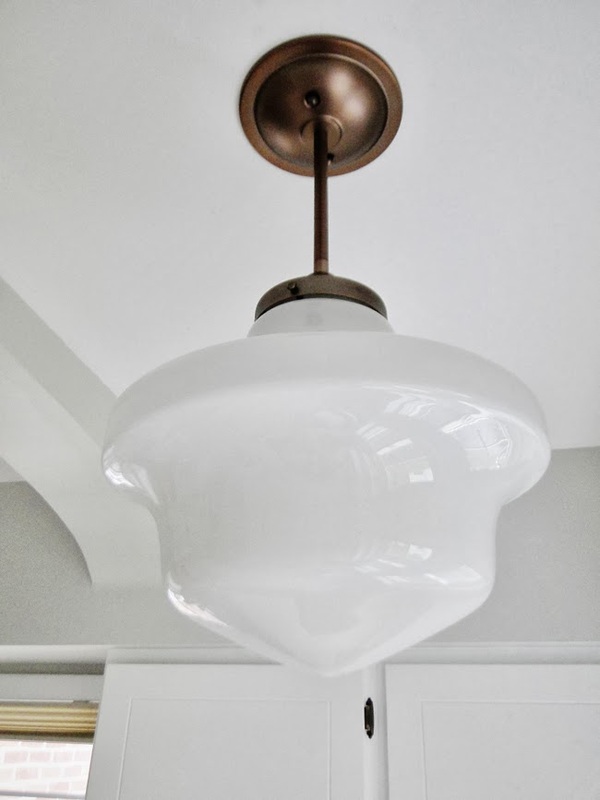 So I was thrilled when National Builder Supply contacted us to review pendant lights for the kitchen! Kev was super busy with helping me get the cabinets ready for the big reveal, so he didn't have much time to dedicate to the lighting situation. Luckily my grandfather was an electrician, so my dad is really handy with that kind of thing and helped us out. (Thanks Daddy!) It's amazing how much more light they shed - it's so much easier to see when we're preparing food! I think Lucy will miss the ceiling fan - she would probably stare at it forever, but I am SO happy it is gone. 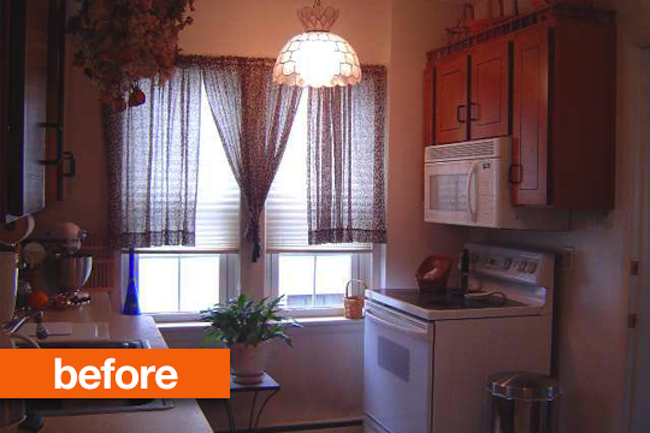 Thank you so much to National Builder Supply for helping us out with the kitchen update, we couldn't be happier with the results! 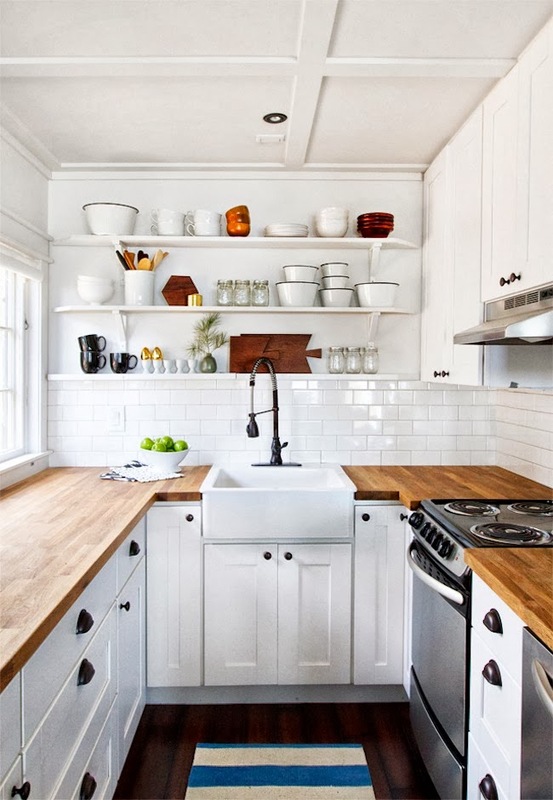 Next on my to-do list for the kitchen is cabinet and drawer hardware - we've been living without knobs and pulls since August, so I'm ready to get going on that project. 1. Six words to say to your child - I've been using this one a lot lately! 2. New baby smell is real - as good as cocaine in fact?! 3. A unique take on the behavior chart + funny parenting fails. 4. Parenting then vs. parenting now. 5. 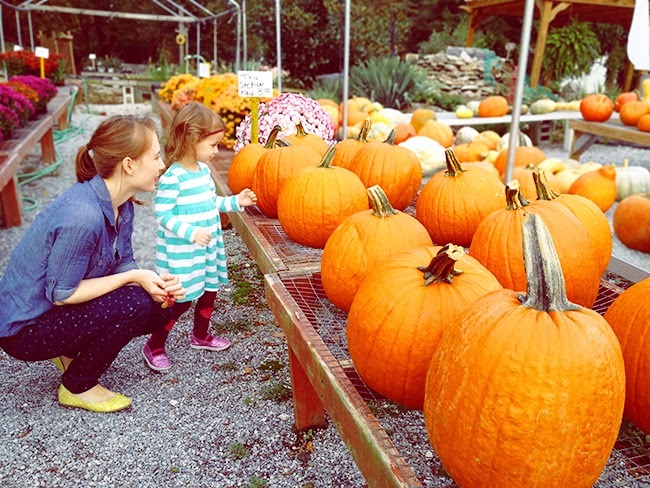 How to be a better mom in five steps. 6. You're doing okay, ma. P.P.S. 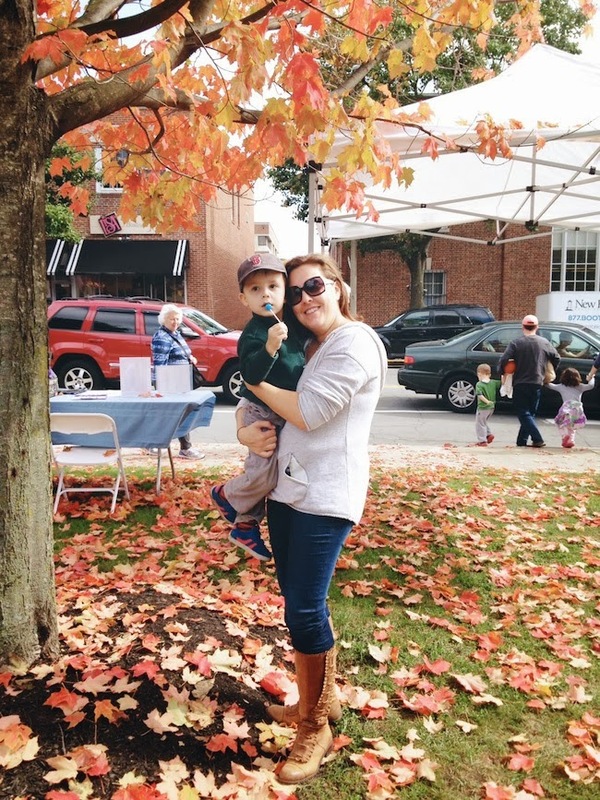 Favorite parenting links from September and how other mamas feed their kids in the morning. Speaking of Fall, one thing I didn't have much time for this year was shopping for a new cold-weather wardrobe for my growing little girl. While I usually love scouring the interwebs for a good deal on "blue, wed, and puhple" clothing, with sweet little Lucy around shopping whether in person or online is just not an easy task any more. 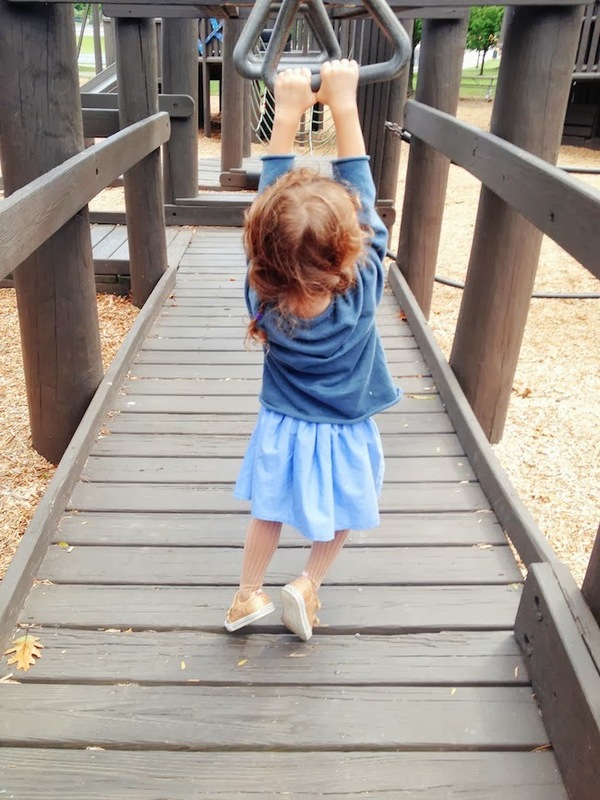 So I was thrilled to try out PanacheBox - basically beautiful (and comfortable) kids' clothing mailed to your doorstep! When the box arrived I was smitten with it's fun shape (we made it into a Barbie castle!) and waited to see what my picky daughter would think of it's contents. Well, she was not disappointed - there were many, "oohs!" and "Oh my's!" - especially when she found a pretty necklace inside. I love that the clothing is high quality and that everything works well with her existing wardrobe. 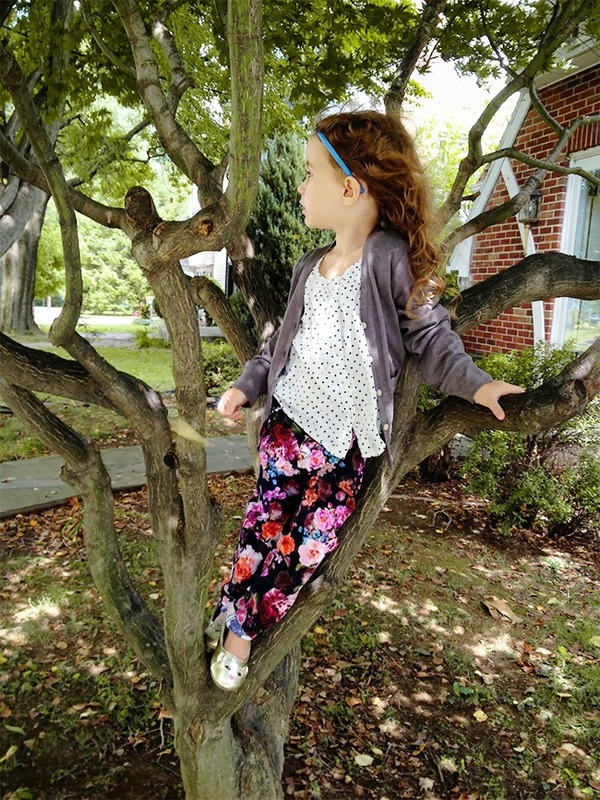 Every piece is very versatile, so were able to mix and match things so easily, and she wears the clothing for all of her normal little person activities - tree climbing, park play, napping, and flower picking. I'm hapy that it's all practical for a kid on the go. 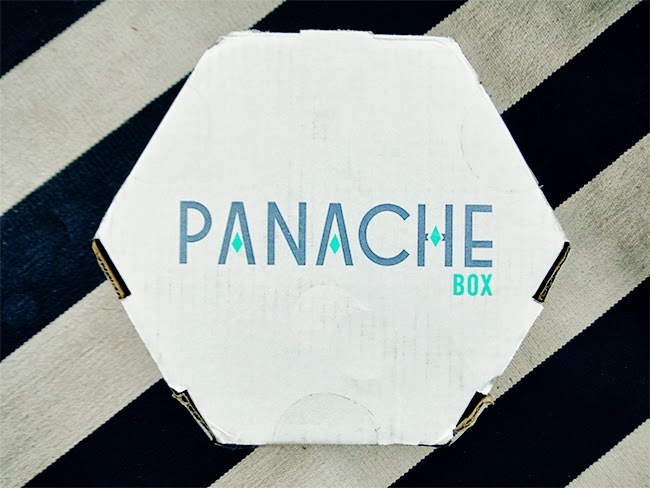 There are two ways you can build your PanacheBox - you can choose items yourself from their website or have them create a custom box for you little one. 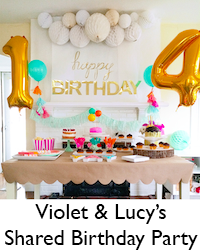 After looking at the site Violet and I liked just about everything, so we opted to be surprised - I really don't think you can go wrong! 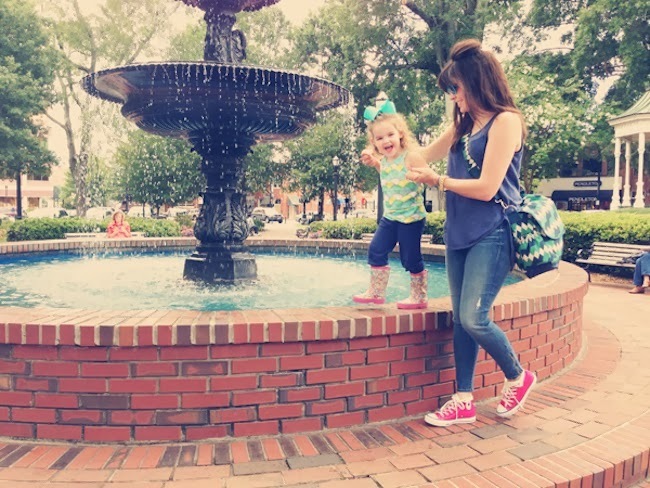 If you're like me and feeling a little overwhelmed with life, definitely check out the site - anything to make more time for my girls and less time for running errands is super amazing in my book! 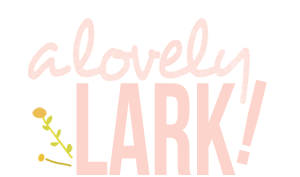 Plus they're offering readers of A Lovely Lark $50 off with the coupon code LARK through October 30th!